Occasionally we have a chance to talk to prize winners of our contests, and for many participants such an interview would give much food for thought about. Winner’s experience can be replicated by traders at different InstaForex contests. Today we have a chance to meet Gennadiy Doroshkevich from Vasilievgrad. 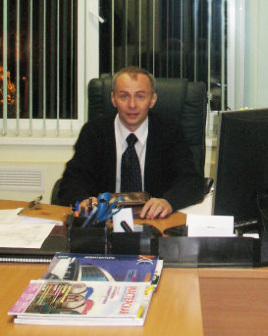 Gennadiy took the first prize in the “One Million Option” contest which was held from 31 October to 5 November. IFX: When did you learn about InstaForex Company and became its customer? GG: I learned about the company and became its customer nearly a year ago. Looking for companies that held contests for demo accounts, I found InstaForex and was surprised by a variety of contests. Since that time I have regularly taken part in different contests. IFX: Are you a regular participant of InstaForex contests, or is it the first time you tried your hand in a competition with other traders? GG: I have been a regular participant since I became InstaForex customer. IFX: What are your major competitors in contests: traders, you and your emotions, or unpredictable market? GG: My major competitors in contests are other traders (yes, I monitor the rating), myself and my emotions and, finally, the market which is quite a difficult to compete with. IFX: “One Million Option” is a relatively new contest compared to other contests. Why did you decide to participate in it? What was the key factor? GG: “One Million Option” is my favourite contest, and I regularly take part in it. IFX: From the very beginning you have been seen among the leaders. When did you understand that you were to win? GG: Despite I was among the five leaders, I was not sure I would take the first prize. Once I already took a prize in this contest. A day before the end I was not satisfied with my third place. I risked and was lucky, although chances to lose were 50/50, I won. IFX: We understand that you may not like to reveal your secrets. Nevertheless, we dare to ask: what is your recipe for success? GG: I cannot say that there is a recipe. I use standard set of indicators in MT and sometimes test new ones (there are lots to test and so little time!). Discipline and psychology are my personal formula. IFX: Did you use monitoring at the contests? Did you watch your competitors’ trading? If yes, what conclusions did you come to? GG: My profession does not leave me time to monitor the market all the day long, I spent five minutes a day on it and I think it’s worth it. I got the first prize and initial deposit for trading on a live account. IFX: Would you like to further participate in InstaForex contests? GG: Yes, I would, with great pleasure. I would like to take the prize in “Real Scalping InstaForex” and “InstaForex Great Race”. IFX: What would you wish to current and potential participants of InstaForex contests? GG: I wish every participant to feel a triumph, and I also wish InstaForex Company success and many good days. IFX: Thank you very much, Gennady. Please receive our warmest congratulations. Let this victory open the gates of further success! What could be added to Gennady’s words? We guess nothing. We wish our customers good luck and splendid victories. Should you like to see your name in a list of winners and show traders your talent, should you be like to be listened to and heard, take part in InstaForex contests and win! Do not miss your chance! This entry was posted on Friday, November 25th, 2011 at 11:25 am	and is filed under Interview. You can follow any responses to this entry through the RSS 2.0 feed. You can leave a response, or trackback from your own site.